The days are finally getting a little bit longer and brighter, and I’m loving it. It’s not that I don’t like autumn or winter (I love them! ), but after December and if there’s a decided lack of snow, my interest tends to wane a little…it’s not even that I long for warmer temperatures, I just prefer to come home and not have it be so pitch black my brain thinks it may as well be the middle of the night! 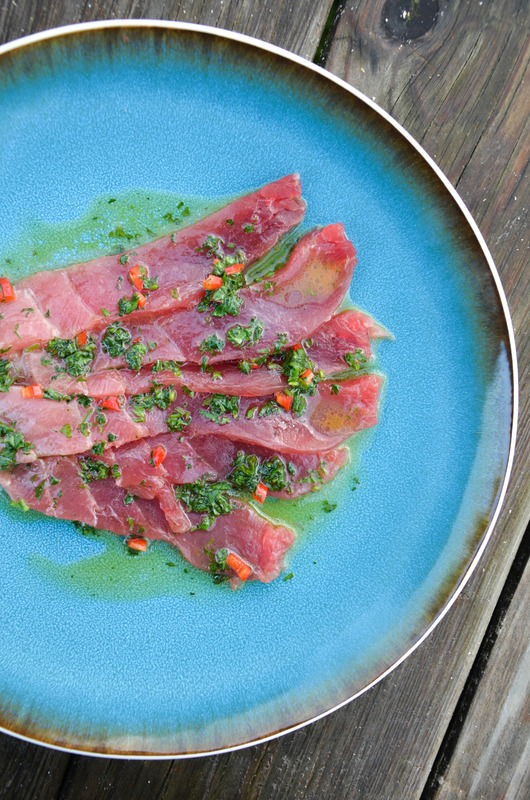 This dish was created when we were having an abundance of gorgeous tuna — whether we went to the farm shop halls or the local supermarket’s fish counter, slabs of tuna steaks were waiting for us, and often at a much cheaper price than usual. So I mean, we had to buy it then, right…? 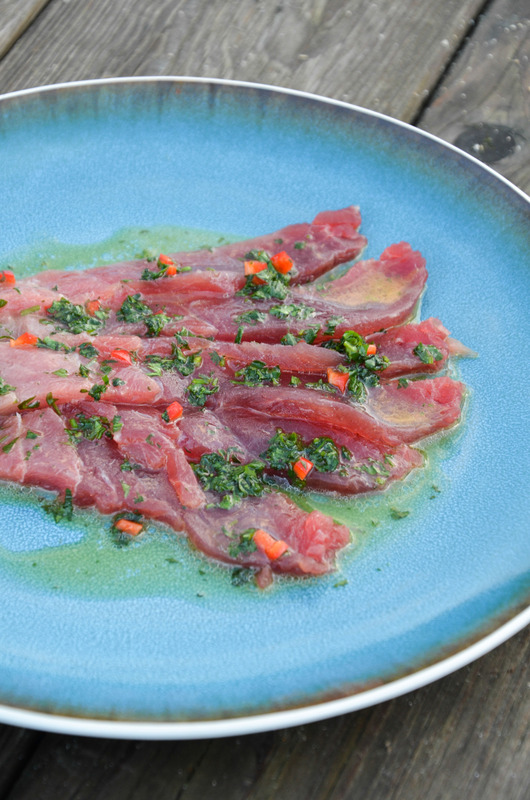 And as much as I love a grilled piece of tuna steak, there’s something so amazingly fresh about tuna that it sometimes seems a shame to do anything to it. It’s probably why my family and I love sashimi so much — when you have a piece of fish this good, why try and change anything about it? So here we have it; a dish that’s a bit of a ceviche and a bit of sashimi combined together. The passion fruit part is a little fussy, but goes wonderfully with the tuna to cut through its richness. It’s pretty handy for serving at a party or gathering, since you can pre-slice the fish and arrange on a plate, and make the dressing, and keep both in the fridge before plating up just before serving. 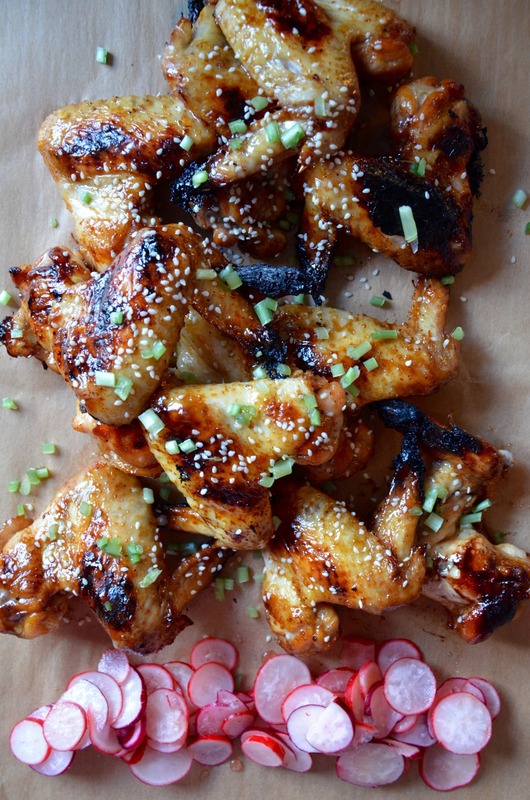 They’re certainly messy, but I do like making (and eating) chicken wings. They feel a bit like bar food, but you can pick up a pack of like 20 of them for almost nothing here in England, and they make a great family lunch for all of us, and all things considered, don’t take all that long. I think they’re more popular over in the States, but the UK is slowly catching on in my opinion, since the town close to us has chicken wings popping up on menus all over the place these days. These are just marinated and grilled in a simple soy, ginger, garlic and honey mixture, which is slightly salty and sweet, and served with a quick home-made radish pickle that pickles as you cook the chicken. 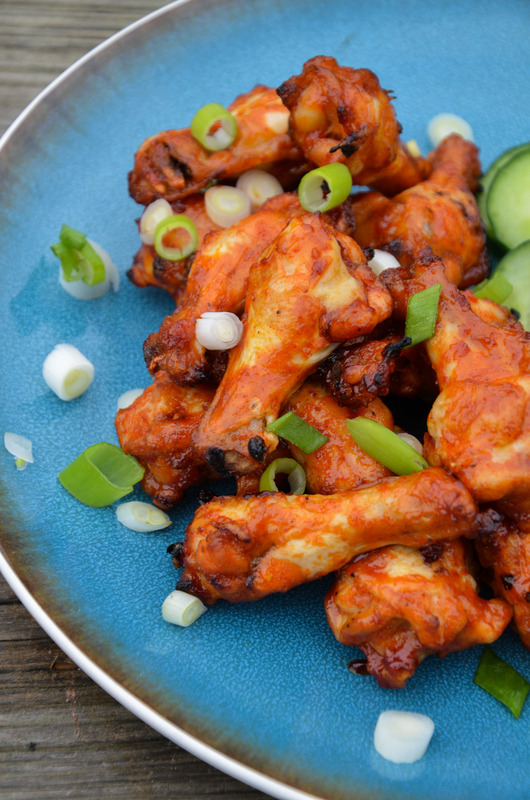 Obviously, you’ll get the best results if you marinate the chicken wings overnight, but don’t sweat it if you find you’re starting barely an hour before you want to eat. 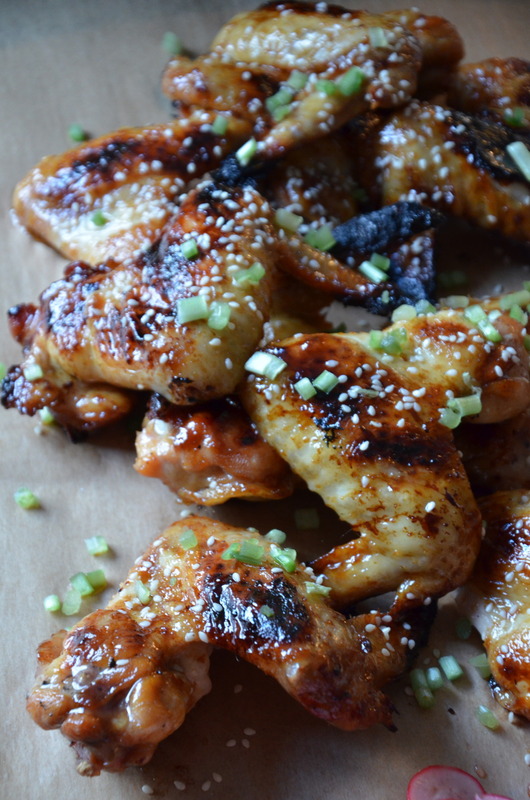 Just make sure to glaze the chicken wings constantly as you BBQ them (which I recommend over the oven, because that BBQ flavour is something you can’t cheat at). This is such a simple dish to make, and takes very little time overall. It makes a lovely starter for a dinner party, or even a wonderful accompaniment with a fresh salad. I’ve also tried variations upon the marinade, including; crushed juniper berries, rosemary, crushed garlic and olive oil crushed juniper berries, sage, dried thyme, and olive oil Most have worked very well, so take the guidelines, and play with the flavours! I think the honey here lends a lovely sweetness that cuts against the richness of the meat. Makes a starter enough for 4-5 people. This is more of an assembly-line list than an actual recipe. But, when the snack attack feelings kick in, this is a great and delicious way to up the ante on your usual toast! It helps to focus on the cheese here; I chose rocamadour goats cheese, which is rather pungent, soft and spreadable, and a rich taste, but of course, feel free to choose your favourite! I recommend one that melts slightly when it meets the hot toast. Preheat the oven to 200 degrees centigrade. Lightly oil a roasting tin, and pop in the figs for fifteen minutes or so, or longer if you have time to spare. Near the end of its roasting time, toast the sourdough and spread over the goats cheese on both slices. Top with the figs, and drizzle over some honey. Finish with a sprinkle of the salt, and enjoy! Ceviche, a dish originating and popular in the central and southern Americas, is one of those dishes I’ve always wanted to try. It’s typically fresh fish quickly cured in citrus juice, such as lemon, and seasoned. Somehow, I never got round to preparing it myself, but I took the chance now, with sea bass. More commonly you see tartares with fish such as tuna and salmon, but sea bass worked surprisingly well, better than I thought actually. Naturally, if you’re not a fan of sushi and the like, this one’s probably not for you! But it’s a very clean, fresh dish that makes brilliant use of fresh fish, so obviously freshest is best. The lemon juice here quickly “cures” the fish, but not for long enough to actually cook it. You can prepare the ingredients in advance; just keep the lemon mixture separate from the fish until you’re just about to serve. Serves 4 people as a starter.